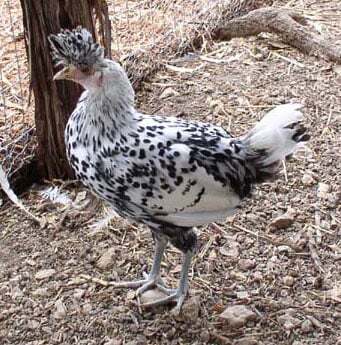 Appenzeller Spitzhaubens are one of two Appenzeller breeds. These are spangled like hamburgs, have a "V" comb, and a topknot that is supposed to be upright and face forward, not floppy like Polish. They are not lap chickens, but they are not flighty either. Weighing in at about 4 pounds with off-white eggs. 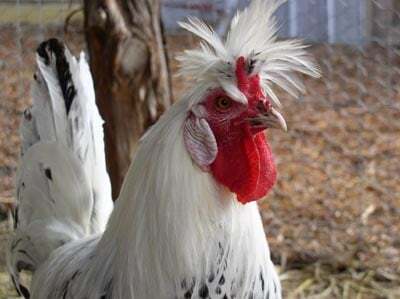 Butch (below) is not aggressive at all, and one breeder said she has only had one aggressive rooster in the three years she has been raising them. They have been shown in Europe for quite a while, but are not recognized by the APA. Here are some pictures of Carla's Spitzhauben hens. You can tell from the picture of the single hen how the topknot should look. 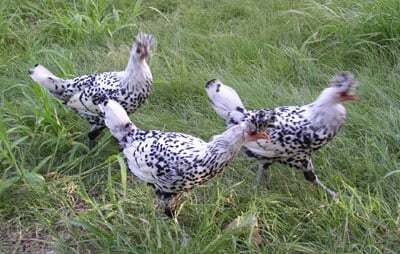 The feathers on the hens' topknots are rounded while the roos are spiked (Polish crests are the same). You need to disenfect your ground. Areas where they travel alot need an insecticide that isnt poison. You can get it at Tractor Supply of a feed store. Hydratd lime in ares they dont use too much. Also for ants and other external skeleton pests ther is Diatomic earth or something with that similar name use food grad DE all around and dust them with it also use some in their food.Make sure its FOOD GRADE tho. i have one Lady Gaga and last year she was very sick, scale mites and low in vitamin d and calcium. I put her feet in cooking oil and gave her vitamin and calcium and she got better. Now she is limping again and have to pick her up in the morning. Going to try the same thing again. Has anybody had problems like this with this breed? she is really sweet!